Taking care of chickens in the winter isn’t that hard. As long as they have shelter, food, and water, they generally do okay. One of the trickiest parts of chicken keeping in below-zero temperatures is making sure they have a reliable water source. 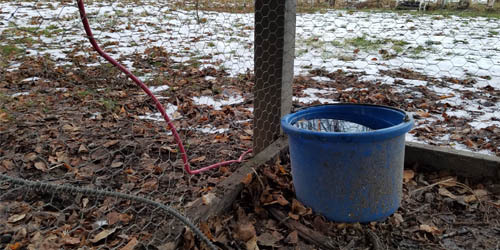 For some chicken keepers, that means running electricity to the coop/run for a heated watering container – something to prevent the chicken’s water from freezing solid. For other chicken keepers, that means making sure their flock always has access to fresh snow to eat. The short answer: yes, they do. Years ago, my first winter as a chicken keeper, I was stressing out over leaving our home for a few days. I had gone through multiple brands and styles of heated water buckets in the backyard chicken run, and while they did their job to keep water thawed at 20F, they all froze solid when the temperature dropped to -10F. 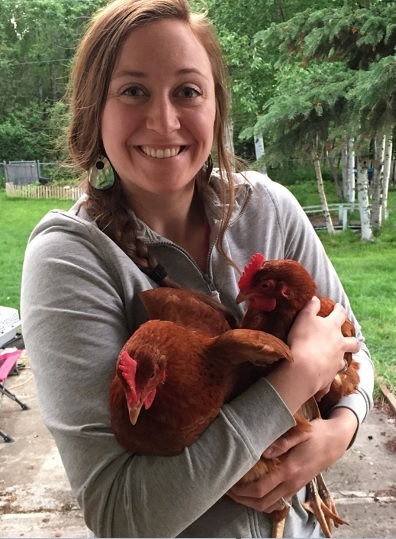 I was hand-delivering warm water to the chickens twice a day, unable to find a solution. I was talking to a friend about my trip and the anxiety building in my stomach, thinking about leaving the hens. What if their water froze solid while I was gone? Embarrassingly enough, that had never occurred to me. As I spoke to more & more chicken keepers, I realized that there’s a great debate in hen husbandry: whether to provide your flock with a water source or have them eat snow for hydration. If you talk to a homesteader or old-school farmer, chances are they let their birds eat snow in the winter. It’s free and low-maintenance. 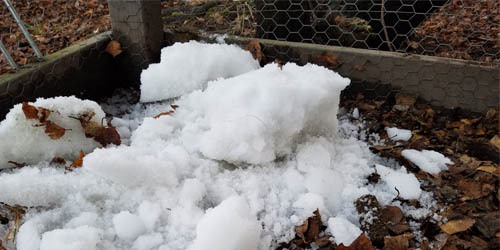 If the temperature is cold enough to freeze water solid, chances are there’s enough snow/ice on the ground for chickens to peck at. Eating snow and ice in the winter months is how the wild birds all around us stay hydrated. It’s instinctual for chickens to eat snow when there’s no source of open water. Mine sometimes choose to peck at snow even when there is water available. While chickens can certainly survive on snow, if you raise chickens for eggs or meat, here’s the real question: is eating snow for hydration the best use of your chicken’s internal resources? It takes many cups of snow to equal one cup of water. While your chickens are eating all of that snow and using their body heat (= energy/calories) to melt it, it’s possible your egg production is suffering in the process. When your birds are ingesting frozen materials, their body is working extra hard to maintain their internal temperature. If your chickens aren’t eating snow for water, then you need to consider whether you want to bring fresh water out twice a day (or more, depending on conditions) or run some sort of electricity. 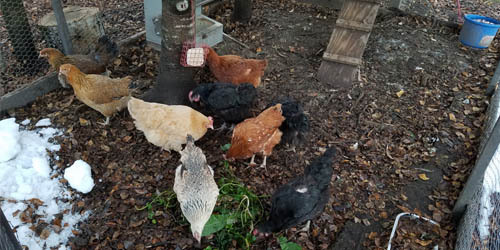 Some chicken keepers actively choose to be electricity-free or don’t want to increase their electricity bill just for chickens, while others (like me) prefer to lean on modern conveniences to have lower maintenance birds. Can chickens survive on snow alone? Sure, they can stay alive & hydrated by eating snow. But can they thrive on snow alone? The honest answer is, I don’t know. Before I leave for a few days in the winter months, if there’s not snow in their backyard run, I’ll shovel a few scoops in. I think of it as an insurance plan in case their electric heated water bucket unexpectedly freezes over. Bottom line: However you choose to take care of your chickens is entirely your decision.